Now that you have made the decision to wash or not wash your fabric before you start, you can get onto the next stage of your quilt. If you are not pre-washing then you can skip this step; otherwise continue on dear reader. The first thing to check is that the darker fabrics are colour resistant. To do this I put a little water and washing powder into a basin or bowl and dip the corner of the fabric. 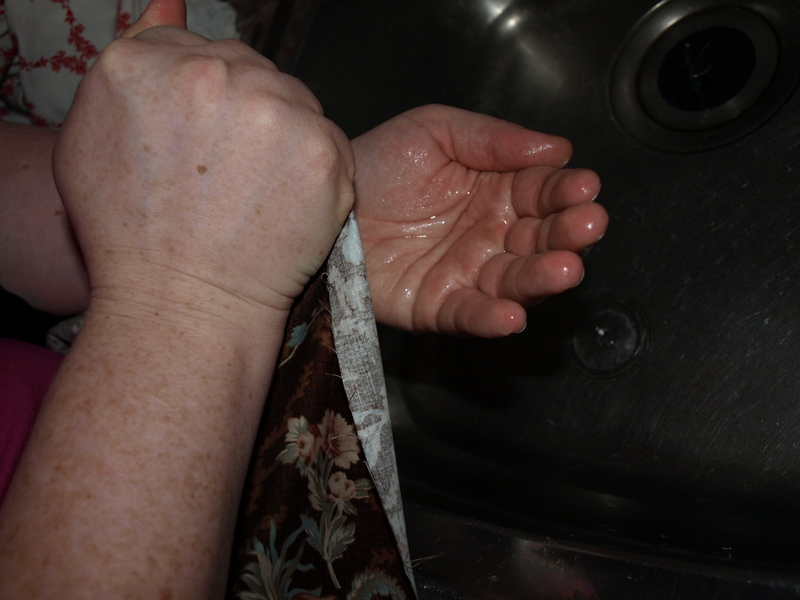 Give it a good hard rub in your hands and then squeeze some of this water into your open hand. If you have ANY colour seepage then wash this fabric seperately. Repeat this for all of your fabrics; wash the light and dark colours seperately in a cool washing machine setting with detergent but NO softener. Softeners will make your fabric more difficult to handle – slightly stiffer fabric is actually better to handle when putting your pieces together and this is why I add a little starch to my fabric. Y0u can do this either in the washing machine or spray it on when you get to the ironing board. Dry your fabric either on a line or in the tumble dryer but it should preferably not be completely dry before you go onto the next step. « Quilting attracts all sorts…..